I just returned from a fun-tastic family vacation to Disney World. It was so nice to get away with the family for a few days and escape the cold here in NY. The African theme throughout the lodge really made you feel like you were on a different continent, from the grass and bamboo hut ceilings, African wildlife roaming all around the grounds and the beat of live African drums in the lobby – I loved everything about it. The weather was around 70°F, so I didn’t take advantage of the 11,000 square foot pool, but it was heated, so my older daughter Karina had to test it out. 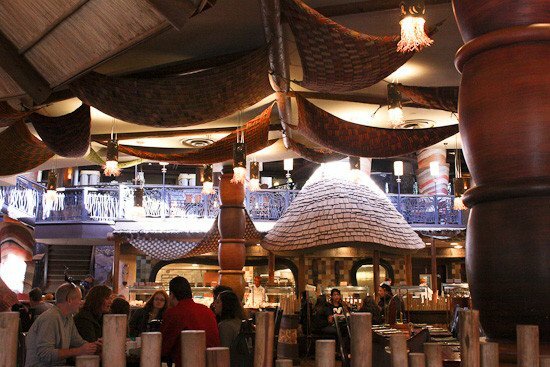 The restaurants offered great flavors of Africa weather you wanted an upscale meal or something more relaxed. 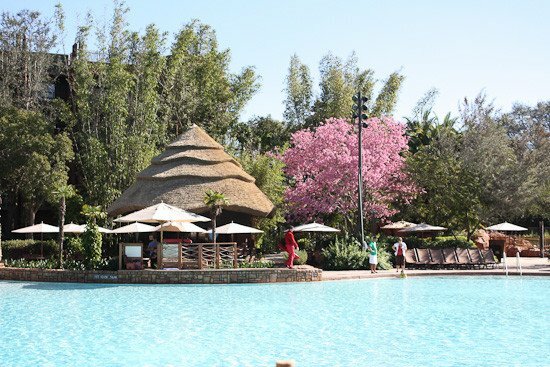 We really loved Boma, which offered a buffet of African dishes as well as American kid-friendly dishes. In the past, when I went to Disney World, I didn’t stay in a Disney hotel, but now that I have, I wouldn’t do it any other way. There are huge advantages to staying in a Disney Hotel that you couldn’t get if you stay elsewhere. which the general public is not permitted. Disney also gives hotel guests free transportation to and from the airport with Disney’s Magical Express. They even get get your bags if you wish so you don’t have to wait for them in the airport, and everything arrives in your hotel room later so you can go straight to the park from the airport. A taxi charges about $67 each way without tip, so that’s a pretty good savings. Transportation to the parks – no need to rent a car, Disney offers free transportation to all the parks, whether by monorail, bus or boat. It’s all about the kids! The hotel has so many activities for children – outdoor movies, face painting, arts and crafts, campfires, a Hakuna Matata playground (that Madison loved), an arcade, safari rides, and more! We didn’t even get to do everything the hotel offered, I guess I’ll just have to go back next time or try one of the other Disney hotels. Have you stayed in a Disney hotel? With so many to choose from, what’s your favorite? OMG! Thank you for sharing such beautiful pictures and article. I always dream going to disney land and i hope I can make this year finally. Keep posting, loved every detail of it!!! My family and I are Disney freaks. I am less than a week out from my 21st birthday and I am quite certain I've been to the parks 100-200 times. We are about 4 hours from Orlando up and would head to the parks 2-5 a year from the time I was born. Now that I go to UCF in Orlando, I have an annual pass and often go once a month. It's a nostalgic place for my family and me and we can go and just walk around and have the best time ever. Likewise, we've stayed at many hotels including: Boardwalk, Beach & Yacht Club, Port Orleans (Riverside & French Quarter), Wilderness Lodge, Fort Wilderness (camp ground), Coronado Springs, Old Key West, Pop Century, All Star Sports and Music, and Caribbean Beach. I've also stayed at countless off-site hotels and it's just not the same. It's not as magical and you don't get the free transportation (although we have parked at the Boardwalk and used the free trasportation…whoops). My favorite is probably Boardwalk or Wilderness Lodge. However, one of my favorite childhood memories was singing campfire songs and making s'mores with Chip and Dale at Fort Wilderness. Seeing how everyone loves AKL, I'll have to check it out! The animals sound incredible! I just stayed at AKL in December–would love a recreation recipe for the monkey bread on the buffet at boma or the house juice! Love your blog! We stayed at the Port Orleans French Quarter when we were there back in November. We adored the resort. It was nice and small and really quiet too. Staying in a disney resort is so worth it! I loved being able to pick up our purchases at the hotel and we got a lot of use out of the extra magic hours. Just thinking about it makes me wish we were going back this year again! If only I had more vacation time off work. We stay at Boardwalk. Lots of fun things to do at night and it's a short walk into the back entrance of EPCOT! We stay at the Cabins at Ft. Wilderness and we LOVE it. We rent a golf cart and are able to get all over the property. They have a ton a wonderful ammenities horseback riding, beach access with boat rentals, pools, playgrounds, hiking, and much, much more. My boys love the campfire sing along with Chip and Dale. We also have watched the Disney fireworks on the beach at Ft. Wilderness. It is just a beautiful area and is so much better than a cramped hotel room. I am going in March for my Honeymoon. We are staying at the Contemporary Bay Towers. We have been debating a trip to Animal Kingdom so I enjoyed reading your experience. I love Disney so much! I'm meeting my family there next month. They live in Miami and I live in NYC (for now). It will be my little sister's first time. She just turned 3 and I'm so excited to see her face light up! I'm not sure where we're staying yet, but I love the Polynesian and Port Orleans. All the resorts are a great place to visit, even if you're just in the area and need a place to relax. The Yacht Club pool/water slide are so fun and it's open to every one! We were at Disney World at the exact same time. We spent Jan 25-28 in Orlando, visiting Magic Kingdom, Animal Kingdom, Hollywood Studios, and Epcot. We had a blast! There were hardly any people there, compared to the rest of the year. I will never go back to Disney when it's packed! Glad you had fun like our family did! I thought it would be less crowded! But I agree, I would never go at peak season. Sounds like you had a fantastic time Gina! I've never been to Disney World and no Disney Land since I was a little girl! Great photos darlin! I'm pretty sure we were at AKL at the exact same time as you!! We were there last week from Jan 21-26!! I agree, it was wonderful. We were in Kidani Village as we went with friends and split a suite. It was hard to be 'good' there (eating wise) but we walked and walked and walked and walked…back on track now!! Glad you had a great trip! Yes we were! I know what you mean, but I too walked soo much so didn't feel guilty. As for resorts, in the Summer…Disney's Yacht Club, the pool is literally like its own water park and for Winter…Wilderness Lodge. Yes, I noticed that on some menu's, great idea. Wish they had nutritional info. I have never gone to Disney but…I'm going to Disney in a week and 1/2!! I loved reading all of the comments. We are staying at Port Orleans and I can't wait! 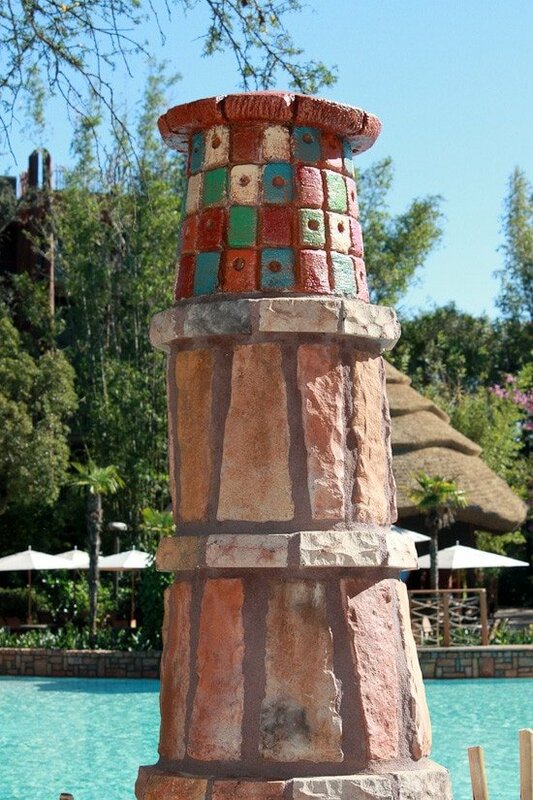 We have only been once and stayed at Coronado Springs which we really liked. Would love to try the Polynesian or Animal Kingdom. Been to Disney plenty and have stayed at the Contemporary, Caribbean Beach and Coronado Springs to name a few. But my favorite by far was actually off-site…the Caribe Royale! The location was awesome. Directly across the street from a Super CVS and 7-11, we were even able to refill our wine stock at the CVS. At the traffic light a few hundred feet from the hotel…make a left and a Super Walmart is down that way, go straight and it's 10 mins to the parks, go right and there's a bunch of restaurants to choose from. I'll never stay anywhere else! how fun! we are heading to Disney next week to escape Mardi Gras! As a child our vacations were almost elusively to Disney. I've stayed almost everywhere on property and have enjoyed almost all of the experiences. As an adult, I plan to take my family to visit too. It's so exciting to see the parks from a different perspective. I think it depends on what you're looking for in a resort experience. If you want a really great pool and fun relaxed environment that I highly recommend The Beach Club. Want to see a cool water parade and ride the monorail? Try the resorts on the monorail loop at Magic Kingdom. Interested in lots of recreational options? Caribbean Beach has lots of options like biking and boats and pools. Have a larger family, or want to take along grandparents? Art of Animation offers suites for 6! You know your stuff, thanks for the comment, very helpful. 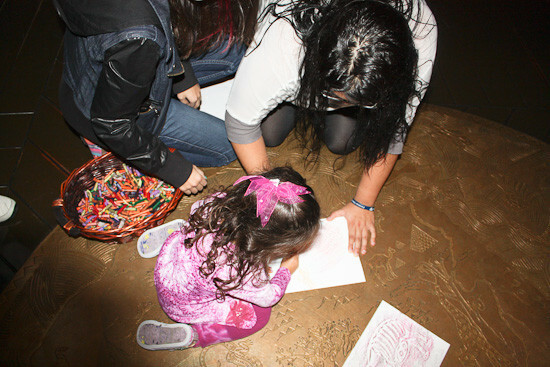 Living in Orlando, I loveee reading visitor's experiences! Next time you visit, I absolutely recommend Disney's Art of Animation resort. Each wing is a different theme – I had the chance to stay in the Finding Nemo suite (the others are Cars, Lion King, and Little Mermaid). In the main pool, you can hear Nemo and Dory talking when you go underwater! I might be 23 but I'm pretty sure I was the most excited person there haha Such a cool place. We've stayed at Caribbean Beach and jus got back from AKL a week go! Loved it. We've stayed at a lot of them but Polynesian is our favorite. Great location and amenities!! Our favorite is the Boardwalk. We love it because you can Walk to EPCOT and Hollywood Studios. We are Disney fanatics and go aleast once a year. We are going again in May and staying at the Beach Club for the first time. I hope we love it as much as we love the Boardwalk. Port Orleans French Quarter was so fun! I loved that you can take a boat to Downtown Disney. Disney obsessed but i never stay on disney properties, they are just too over priced. i get luxury 1 and 2 bedroom suites at gorgeous resorts for half the price just down the road, however…i love The Little Mermaid and i would like to stay in that room at Art Of Animation one day! we love disney but since we live in South FL we are like "whatever" about it, since we get to go on a weekend all the time. but we do enjoy ourselves when we do go. glad you loved it so much and were able to escape the cold! My husband and I have been to WDW twice together, and we leave next Thursday for a 9 day honeymoon! I'm super excited to try Boma! Anyone have suggestion on best resort for a couple without kids? I'm going next January for the marathon. My husband and I always thought if we ever went without kids (very far away) we would go back to the Grand Floridian. It is beautiful there and we love the level of professionalism. I agree that staying in a Disney hotel is the best! One year we stayed in the log cabins – a little off the beaten path, but fun for the kids. They are really trailers made to look like log cabins. They have little kitchens, so we were able to have breakfast in the cabin and keep snacks, drinks, etc. in the fridge. We LOVED Boma! I asked for a couple of recipes and the emailed them to me right away – I was very impressed and have made one of them many times. I just got back from Disney right after Christmas and we stayed at the Coronado springs Resort. I LOVED it, but looking at your pictures makes me want to stay here next time. I JUST Love Disney World! Oh my gosh, what an awesome vacation! Your pics are lovely, how amazing to have giraffes outside your window! You and your daughter look like you're having a blast! We haven't been to WDW yet, but really want to go. We just got back from staying at the Grand Californian at California Adventure/Disneyland and I totally agree about all of the advantages of staying at a Disney property. We all ran Disney races – I did the Tinkerbell Half and the starting corral was literally right in front of our hotel.The extra hour at the parks, facilities, location, child care, etc all made the vacation that much more enjoyable. Thanks for sharing your awesome vacation story and pics with us! 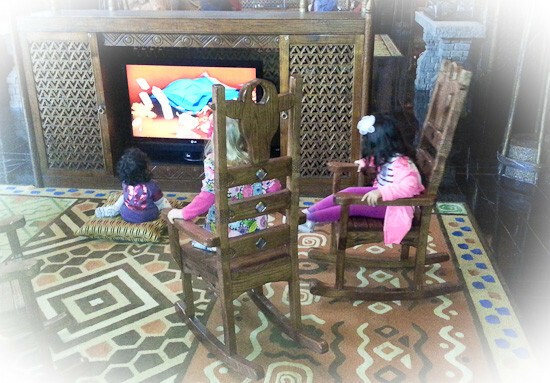 I just got back a month ago with my then, two month old baby boy, and stayed at Animal Kingdom Lodge – Kidani Village. I had never been during Christmas and the parks and resorts are beautiful during this time! The dining plan will save you a good amount of money if you purchase a lot of park food and resort restaurant food. What a fun trip! We haven't been to Disney World in years and when we did we stayed at one of their condos, which was perfect considering we went with extended family. Your photos have me dreaming of visiting Disney World again, so hopefully soon! Go back!! So much fun! Your family looks like they've had an absolutely amazing time! My fiance and I are hoping to make the trek over to Florida some time this year! It's been FREEZING up here (I'm not too far from you, I'm in Connecticut) and we'd love to escape the cold, too! We've stayed at The Board Walk, Old Key West, and Bay Lake…Bay Lake was definitely the most contemporary, and super close to the Magic Kingdom (but the most expensive!). Old Key West was really relaxed and tropical and sounds really nice right about now as flurries are coming down outside my window! I'm one of those huge Disney dorks, I even write a Disney-related blog! So far Port Orleans Riverside has been my favorite. I stayed there on my honeymoon and it's got a very romantic atmosphere. But there are still many more I want to try – including Animal Kingdom Lodge! I'm really jealous – I LOVE Disney! I stayed at the Caribbean Beach resort for a one-week vacation years ago. Loved it! We just returned from Disney on 1/10/13 and we had a blast! We stayed at Art of Animation in a Little Mermaid Room. It was a smaller room, but the theming was awesome! They also offer family suites which look pretty cool from the pics I've seen. From the comments here, I'm glad I made the decision to stay on property for my girls' first visit! Sounds like the best way to do it. Little Mermaid room, my teen would LOVE that! Love the Animal Kingdom Lodge (and Boma!)! Any chance we'll get some skinny versions of their delicious soups (like the curried cauliflower)? While they are delicious, I'd bet there's nothing skinny about their Zebra Domes. We did. We stayed in the Caribbean Resort in one of the Pirates of the Caribbean rooms. I have to say you are absolutely right – we will never stay outside of Disney ever again. It was absolutely wonderful!! Can't wait to go back!! We were at WDW two weeks ago for the marathon and we stayed at AKL – it was our first time staying there. While the Polynesian is still our favorite, AKL was AWESOME and Boma was EXCELLENT! Looks like so much fun! You were so close to my girl who goes to college in Lakeland. Both of your girls are BEAUTIFUL! Enjoy your Monday! Well I might be a little biased as I am a Disney Castmember… who also happens to work here… but Wilderness Lodge by far is my favorite!!! Artist Point is a NOT to be missed place for a wonderful meal! The pool area with its lazy creek rambling by, is the best!!! Cool! What character? Good to know, love all this info! We are Disney Vacation Club Members. 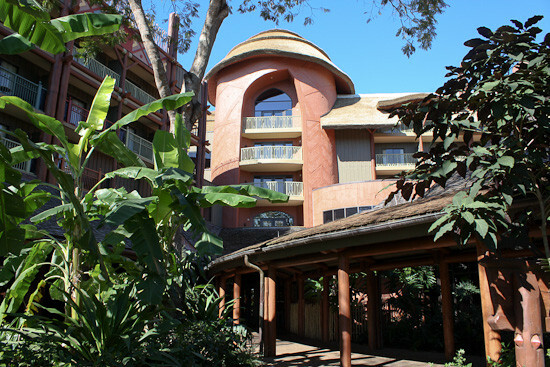 Animal Kingdom Lodge was our first stay at a Disney resort in July 2011. It was amazing! We've also stayed at the Grand Californian and have a trip booked at Aulani this June! Looks like you guys had a great time! Animal Kingdom is one of my favorite Disney Parks! Wish you were there Nina! We just got back from Disney on Friday! We stayed at the Port Orleans and really enjoyed it. We had dinner at Sanaa's which is in the hotel you stayed at and it was absolutely awesome! It was so cool to watch the animals while we were eating. This makes me miss Disney!! We always stay at The Polynesian when we go there. I also love the Grand Floridian, though. I think that's one of the most beautiful hotels. So jealous! My family and I love Disney! We stayed at the new Art of Animation Resort – Nemo. There are six of us all together and the new resort fit us all comfortably. My all time favorite is the Polynesian because of the monorail. I was able to return to the parks in the evenings with just 2 of my kids (the 2 that weren't worn out!) and we enjoyed some of the rides during the Electrical Parade (think shorter lines 🙂 We have plans to return in another 5 years and we hope to stay at the Contemporary (my oldest will be graduating this year and probably won't be making the trip so we should fit). We had dinner at Boma and it was outstanding! My favorite was the Tunisian Couscous Salad. I managed to find the recipe on the internet, but it makes a ton – I would love to see a lighten up version on your blog! I love your blog and my family eats healthier because of it. (P.S. – I lost 30 lbs. prior to our last Disney trip in August and your recipes were a BIG part of that loss. I didn't have to sacrifice taste in order to be successful! Thank you! Looks like you had a great time. Spending time with the family is the best time. Love the pictures.. I've been going to Disney since I can remember (my Dad's family lives in the area, so we'd go visit them every summer until I was about 18) Now, my hubby and I go every October, to the Epcot Food and Wine Festival – and although, it's not a Disney property, The Swan and Dolphin still have access to some Disney benefits (in-park transportation, Magic Hours)…We stay at the Dolphin and the convenience is worth the cost! We walk to Epcot and take the transportation to the other properties. 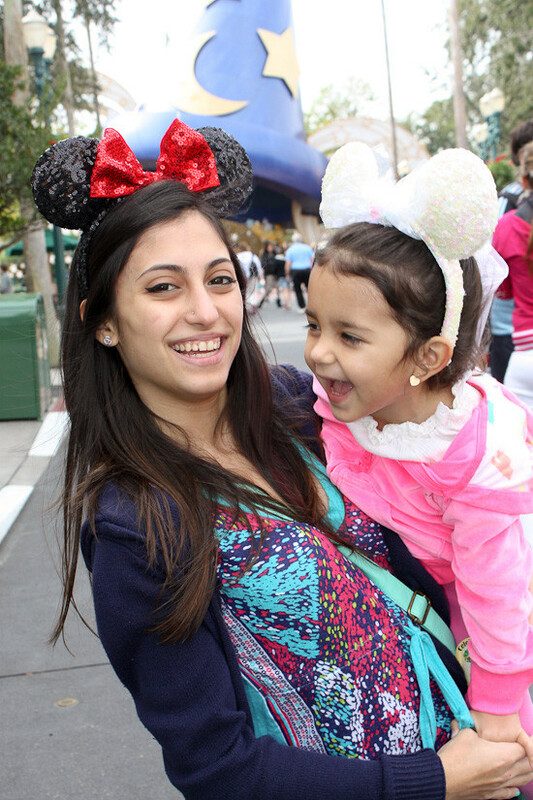 I LOVE Disney – no matter what your age, you always feel like a little kid when you go! We are huge Disney fans! By far, our favorite place to stay is the Yacht and Beach Club. It has the BEST pool on property and its closeness to Epcot is wonderful! Love the first picture of you and your daughter! I have to say I have never been to any of the Disney Parks. I really need to go soon! I wish I was that young Jennifer, that is my older daughter! My 19 yr old and 3 yrs old. We stayed at the Beach Club Villas over Christmas. Loved the short walk to Epcot (our favorite park), and its central location makes it easy to get to all the other parks. Plus, the villas have a full kitchen, so we were able to eat breakfast and keep drinks/snacks in our room. Housekeeping even does the dishes! We had lunch at Boma one day, and I agree that the ambience at the Animal Kingdom Lodge is wonderful. Our favorite meal was at Maison Paul in the French area of Epcot. Worst meal and worst service — by far! — was the Yachtsman Steakhouse at the Yacht Club. We've stayed at Port Orleans, Shades of green (military hotel on disney property), polynesian, and off disney property at the Omni. I actually disagree with you about Disney transportation, I've had issue with it and found the best way to get around is by rental car, its definitely more efficent. Ate at Boma one of the last times we stayed there and loved it, hope you can duplicate some of those flavors in some skinny recipes…glad you had a great time! We like Old Key West, a one bedroom. The tub is a whirlpool. I go to Disney World on a regular basis (at least once a year) and have since childhood. It is safe to say I have been there at least 25 times in my 28 years. My husband and I were married at Sea Breeze Point on the Boardwalk in 2007. So, the Boardwalk will always have a very special place in my heart. The Boradwalk resort area is one of the best on property because of the proximity to Epcot and Hollywood Studios. Plus the ambiance of the Boardwalk at night is hard to beat. So, that is one of my favorite. However, we also really enjoyed Bay Lake Tower at the Contemporary when we stayed there. With so many wonderful resorts it is hard to choose just one. There is a resort for every taste and personality! It really is tough to choose! Love that you got married there. Never been to Disney World, but that changes this Sunday. We are staying at the Floridian! We hav3 hopper pass for 3 days too. Can't wait!!!! BTW, your site is awesome! You're going to have the best time, enjoy! We also love AKL! We stayed there in 2002 for the first time and have been back two times since. I don't want to stay anywhere else now. It's like another world, even outside of the other world that Disney is. I'll be going to Disney in April. Living in Florida now I am able to take advantage of driving 2 hours to get there. LOVE IT!! I've stayed at all of the All Star Resorts, Pop Century, Animal Kingdom, Boardwalk, Yacht and Beach, Caribbean Beach, Coronado Springs, Port Orleans(both Riverside and French Quarter), Swan and Dolphin (even though not technically Disney). Our favorite is Port Orleans, either one. 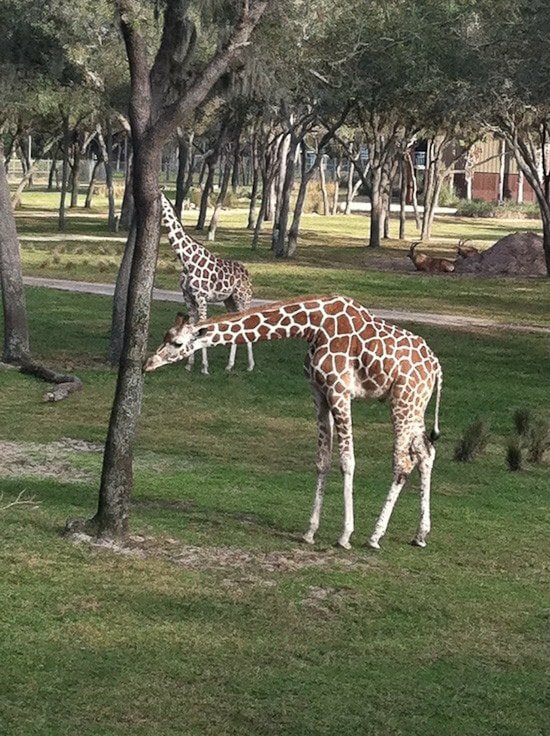 Also loved Animal Kingdom, the view from the room can't be beat. Our goal is to stay in them all somehow! We ate at Boma a few months ago. We've never stayed there but always talk about doing that with the animals there haha. Glad you had a great time!! I LOVE the Animal Kingdom lodge. I've stayed there a few times, and am going back in April (splitting between there and Contemporary). I have a friend who is a cast member, and have stayed in one of the super expensive, super plush 2 bedroom suites at AKL. Talk about a fantasy! Now I'm even more excited about my trip! I have been to: Port Orleans French Quarter, All Stars Movie Resorts, Boardwalk, Contemporary, Animal Kingdom Lodge and Wilderness Lodge. And definitely, my favorites are Animal Kingdom Lodge and Wilderness Lodge!! My fiance and I LOVE Disney! We are planning our honeymoon there for next January. We stayed at the Army's place last time, Shades of Green. We looking at the Boardwalk for our honeymoon. My family and extended family stayed at the Animal Kingdom this past November and it was a blast. It is a wonderful hotel and the Africa Buffet is fantastic. We stayed at Caribbean Beach. It was a lot of fun with a themed pool and beach area that made you feel like you were on a beach instead of in the middle of FL. I have stayed at Caribbean Beach (you seriously feel like you are in the Caribbean when you're there) and the Wilderness Lodge, which was my favorite, they even had a boat that you could take to the Magic Kingdom. Disney is #1 at the "customer experience" and making your trip magical. Disney World is one of the best places in the world! I remember going to the Polynesian when I was younger. Every time we went to Disney, we stayed there. I always made my parents take me on a monorail ride the minute we dropped our bags off in the room. I loved the Boardwalk as an adult, but really you can't go wrong with any of their hotels. I've taken my husband twice. Once we stayed off property and had to drive 20+ minutes to an from the motel to get to the parks. The other time we stayed at the Coronado Springs. He says he will never again stay off property. Did you do the Disney Dining Pass? Best money I've spent there. You get to try tons of restaurants and it's kind of like being at an all inclusive resort! I agree with another poster…the O'Hana restaurant at the Polynesian is wonderful as is the Maya Grill at the Coronado. I ordered duck the first night we were there and we contemplated going back every day for dinner! There were just too many choices throughout the park though so we opted to expand our horizons. I could go on and on, but that's about enough of that. Glad you had a great time! We didn't have a dining pass but next time I think I'll get it, we spent a fortune on food! Been to Disney only once and stayed at Polynesian. We LOVED it. Our kids are small so the monorail was super. People always say the kids were so young they won't remember it but I(and my husband) remember the magic and would not have changed going so young with them! Disney Cruises are nothing short of amazing!! We have cruised with kids & just as a couple. Would recommend to anyone!! The ships have so many dining options too. You always have the option of adding on a Disney World stay before or after your cruise too. We live 3 hours from Disneyland so we do Disneyland much more often. I worked at Disney World for a few years. At Disney/MGM Studios (now "Hollywood Studios") and at the Port Orleans and Coronado Springs Resorts. So, of course I love those two. But, Wilderness Lodge might be my favorite. We went when I was a kid and it was new. I remember coming downstairs in my PJs at night and partaking in the hot chocolate and cookies they had in the lobby. We haven't done Disneyland or World, but will be doing a Disney Cruise next week, and it looks awesome. Disney knows how to do it right, it seems! I will definitely have to look into a Disney hotel when we actually hit WDW or Disneyland. Yes, it really makes all the difference! I am dying to do a Disney cruise! Animal Kingdom Lodge was great, love the Yacht Club, Polynesian used to be our place of choice. Ah-also stayed at the Boardwalk, Grand Floridan, and several others. Love WDW! the Polynesian is our favorite! 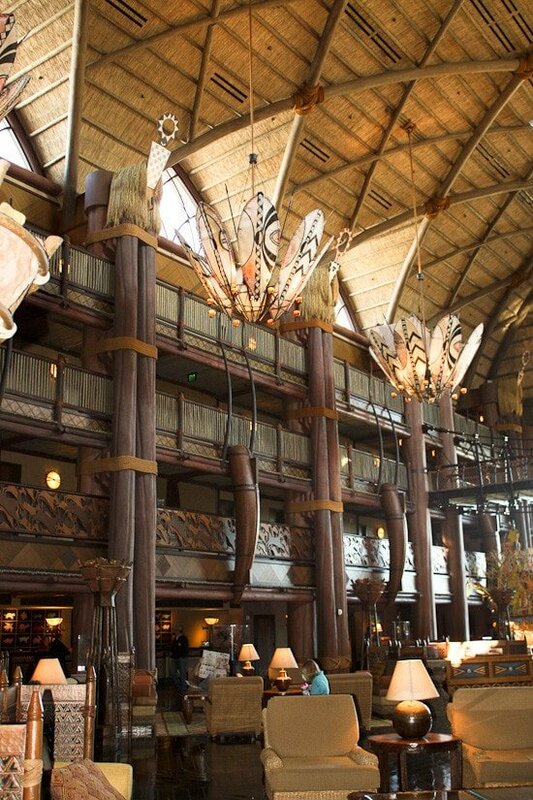 My family stayed in the Animal Kingdom lodge when we went a long time ago–it might have been when it first opened. It was so incredible getting to see the giraffes right outside on the balcony!! When I was younger, I did. I'm not too sure of the name, but I remember just how magical the experience was for me! We had club level access, could walk to the attractions, our room was decorated….always take your child to Disney Land/World when they're young, they'll never forget it! We have a small Disney "problem". 🙂 We've stayed at: Pop Century, Grand Floridian, Polynesian, Bay Lake Towers at Contemporary, Wilderness Lodge, Saratoga Springs, Boardwalk, Yacht Club, Beach Club, Coronado Springs, Port Orleans Riverside, Port Orleans French Quarter, and Shades of Green (with a friend who's military). Our favorite is Boardwalk, by far. We really enjoyed the Port Orleans resorts too. Wow! All those and your favorite is Boardwalk, good to know. We have the same Disney "problem". we have stayed at Pop Century (didn't care for), Port Orleans Riverside, Caribbean Beach, Contemporary, Bay Lake Towers at the Contemporary, Old Key West, Polynesian, Grand Floridian, Boardwalk and the Beach Club. Our favorite is the Beach Club with Bay Lake Towers and the Grand Floridian following them. We really like both the moderates as well (Caribbean Beach and Port Orleans.) I wouldn't stay off-site again after staying onsite either. Hi Heather: Wondering why you picked Boardwalk? We've stayed at Grand Floridian, Wilderness Lodge, Polynesian and Contemporary. Grand Floridian was our fav, but I have wondered about the Caribbean Beach or the Boardwalk and Beach Club. It really is the happiest place on earth, no matter how old you are! My teen is 19 and she acted like a kid again. I LOOOOOVE Disney World! We usually stay at Pop Century (Love it… it's all we need!) But my parents have been staying at the new resort, Art of Animation, and they LOVE it! If you go back, try out O'Hana's restaurant, at the Polynesian Resort… BEST food I've ever had! The waiters come around with skewers of all kinds of stuff, and you make your own plate with what they have! Glad you escaped the cold weather! We loved the Boardwalk…boat ride to one park and back entrance to Epcot. We went into Epcot every night for fireworks and different restaurants. The entertainment on the Boardwalk is also fun at night…my son got to spin plates with a performer! I went there the last day just to check it out, it was very quaint. In the parks I really didn't see too many skinny options, they did have veggie burgers and grilled chicken in some of the parks. If you stayed at a restaurant where you sit with waitress service, then you had a lot more options like salads and fish, but you paid a lot more for it. Since we walked so much, I felt it all balanced out. We just got back from Disney too and stayed at Port Orleans French Quarter. There were decent options at the breakfast there, oatmeal, fresh berries, bananas, yogurt, etc. The food at the parks (except Epcot) was disgusting. Disney has a lot of healthy options you just have to know where to look. They also have stations where you can ask ppl abt better food options based off of preference or allergies. So far my favorite Disney hotel is the Polynesian! It's absolutely breath taking and a short walk to the TTC or a boat ride away from the Magic Kingdom! Good to know, I may try that next, I passed it on the monorail.